34. On May 6, the cross of Baixi Christian Church in Yandang town, Yueqing County, Wenzhou, was demolished. The construction of Baixi Church was approved by the government, and the church obtained all paperwork required by the government. The government approved even the cross of the church. The church downsized the cross by dozens of centimeters from the original plans in order to be in compliance with government regulations. 35. 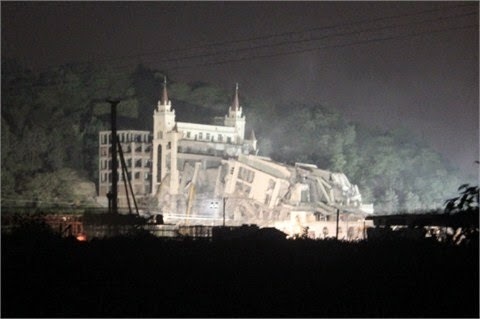 On May 6, Bao'ao Church in Nanxi'ao pastoral area, Wenzhou, faced demolition. 36. On May 7, the cross of Taoyuan Catholic Church in Pingyang, Wenzhou, was covered with cloth. 37. On May 6, the cross of Shamen Church in Ouhai District, Wenzhou, was wrapped up in cloth. 38. On May 7, the cross of Qiaosi Church in Hangzhou, Zhejiang, was demolished. 39. On May 8, the cross of Wuchang Church on Wuchang Road in Hangzhou was removed, along with the church's sign: Wuchang Christian Church. 40. On May 8, the cross of a Catholic Church in Cangnan county, Wenzhou, was demolished. 41. On May 8, the cross of Lingxi Sabbath Day Adventist Church in Cangnan, Wenzhou, was removed. 42. On May 8, Hebing Church in Longwan, Wenzhou, was demolished. Guarded by police, workers only took two hours to tear the church down to the ground. 43. On May 9, the branch of Longwan Church in Shangwan village, Wenzhou, was demolished. 44. On May 12, Bethany Church in Wenzhou received a notice demanded the church to stop gathering. 45. The sign of Bingwang Church in Yiwu, Zhejiang, was removed. 46-4, the crosses of three churches in Jiande, Zhejiang Province, were demolished. 59-51. In mid-May, the cross of Shuangheyan Church in Yongjia County, Zhejiang, and the annexes of Huangtian Church and Fengbu Church, which were under construction, were demolished. 52. On May 16, the cross of a Yangshancang "Little Flock" Church in Shanglu, Yongjia County, Wenzhou, was demolished. 53. On May 16, the cross of Heyu Church in Shanglu, Yongjia County, Wenzhou, was demolished. 54. On May 16, the cross of "Little Flock" Church in Zhikou, Yongjia County, Wenzhou, was forcibly demolished. 55. The cross of Shancang Church in Yongjia County was demolished. 56. The cross of Zhang'ao Church in Yongjia County, Wenzhou, was demolished. 57. The cross of Jiuzhang Church in Yantou, Yongjia County, Wenzhou, was demolished. 58. On May 17, the cross of Lutian Church, Yongjia County, Wenzhou, was demolished. 59. The cross of Ruo'ao Church in Yongjia County, Wenzhou, was demolished. 60. The cross of Huangcun Church in Yongjia County, Wenzhou, was demolished. 61. The cross of Lishe Church in Yinzhou District, Ningbo, Zhejiang, was wrapped up with cloth by the government. 62. On May 17, the cross of Henglan'ao Catholic Church in Wuniu Street, Yueqing, Wenzhou, was demolished. 63. On May 17, the cross of Yantan Church in Yongjia County, Wenzhou, was demolished.